In the weeks leading up to Christmas, and particularly on Stir Up Sunday, there was always a smell of baking from the kitchen in our house as my grandmother carried on the traditions of her British ancestry. It was all a slow dance to Christmas as pudding were laid down, mince pies made and a traditional Christmas fruit cake and a white fruit cake in which the fruit was soaked in beer – my grandfather loved eating this with a glass of Milk Stout in the late morning. Prepare, butter and flour a cake tin 28cm by 6cm. Place the fruit in a bowl and pour over the beer. Allow to soak for at least two hours. Sift the cake flour with the spices and baking powder. Whip the sugar in a large bowl adding the sugar slowly until all the sugar is added and the mixture well creamed. Add the eggs one at a time with a spoonful of the flour mixture, this will prevent curdling, though it is not important if the mixture does curdle. Beat in the moskonfyt and lastly fold in the almonds. Add the fruit spoonful by spoonful mixing well between each addition. Add any remaining beer. Spoon the batter into the cake tin and smooth over the top. Cut a kitchen paper cartouche the same size as the tin to use later should the cake get too brown during the baking. Bake for one hour and ten minutes. Should the cake get too brown on top, cover with the cartouche. Test with a metal skewer that should come out clean when the cake is baked. Allow the cake to cool in the tin for a short while before turning out onto a cake rack to cool down. Wrap in muslin, soak with brandy and then wrap in cling wrap and store in a cool place. 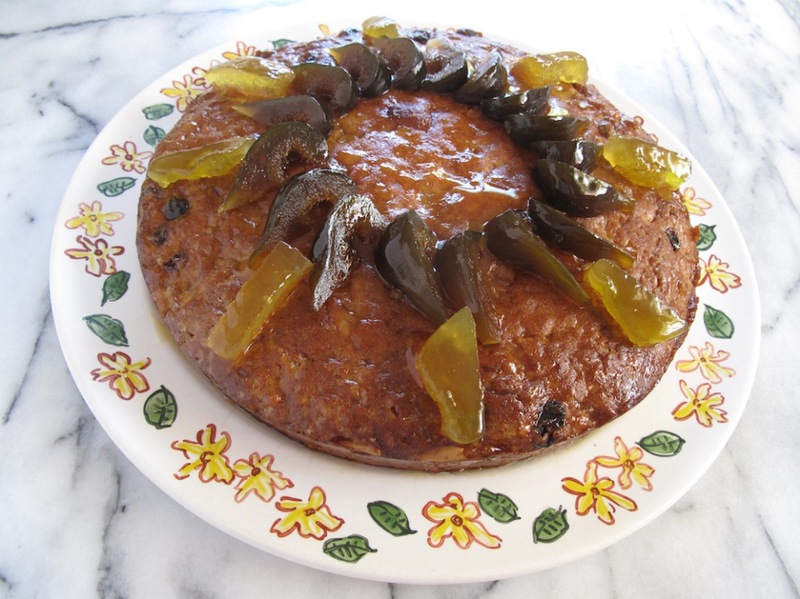 Once a week unwrap and drizzle over a little brandy to help with the maturation of the cake. When ready to serve, garnish with the fruit over which you brush a little melted apricot jam.